I’m excited that it’s December and we finally get to share holiday books 🙂 I have such a sweet book for today! In past years, I have stuck to books like Mr. Willowby’s Christmas Tree which, though about Christmas, are not at all religious. The book I’ve chosen today veers a little closer to the traditional story of Christmas but it’s so beautifully done that I think it’s appropriate for everyone, regardless of religion or belief. I hope you get a chance to read it! Brief Synopsis: An extra special baby is coming and the newest angel wants to give a present. But what can she give? Wind is the sky’s gift. Rain is the clouds’ gift. Music is the gift of the songbirds. But when the little angel sees three lost travelers, she knows exactly what to give – the best gift of all! I absolutely love your selection today! I just read the book this week. Peter's illustrations add something very contemporary for kids — that isn't overly religious. Many kids can enjoy this story. Excellent choice! Oh my! I can actually respond today! Can't believe I get a chance to see the comment section. And, for once my entry is already done for next week's contest. Yay … love Peter Reynolds and love knowing there's another of his shining stars to look out for! And I see that someone picked the same book I did so I'm headed there next to see that review! Happy PPBF, Susanna. 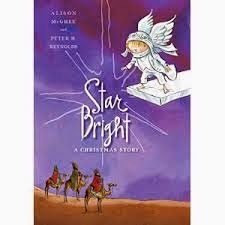 I think I'll like “Star Bright” – because one of my favorite books as a kid was the “littlest angel”. I've always had a soft spot for a story about little angels and shiny things. I've never heard of this one, but I adore Peter Reynold's artwork so know that it will be very cute! Our library is really good about setting aside shelves for each major holiday, so I'm sure I can find this there, unless some little kid with his/her grubby little paws got it before I get there. Hah! This book looks great. I'm about to actually post my PPBF. How did it get to be Friday already? This looks LOVELY. Definitely requesting it from the library. Thanks, Susanna! Happy December, Susanna! I hope my library has it too – looks lovely! I'm digging the threads on that little angel! Looks and sounds very sweet! Great to add to my holiday season reading! This one does look very sweet. Nice way to start the holiday books Thanks for the review. It's very cute, and I think quite cleverly done. It's hard to tell the Christmas story without really going biblical and she pulled it off! Your lucky all you have to think up is the title over the weekend… I have yet to think of an idea… or write it… 🙂 And how awesome that you can just walk over to a shelf and pull out a book! I'm behind! I need to check out last week's PPBF books and today's list. Here it is bedtime and I'm just getting here. And I didn't even add a book this week. Star Bright sounds very sweet. Thanks for sharing it. I'm really looking forward to reading the contest entries! Yay! Love it, Susanna! Thanks for the suggestion!